This works great for a hanging Christmas decoration!. Gather your supplies. The paper can be different colors. The stapler works best if it's small (like mine). THERE IS NO TAPE IN THE PIC BUT YOU NEED TAPE.... Content may contain affiliate links. If you click & make a purchase, I receive a small commission that helps keep this site up and running, at no cost to you. 3D snowflake design: each snowflake is composed of 3 layers of snowflakes, snow is tiled when you receiving, you need to fold up the snowflakes along the suture, easy but should be careful Package includes: comes with 5 pack snowflake hanging, each string decoration contains 12 pieces snowflake, 9.84 feet long each, total 49.20 feet how to provide excellent customer service online 23/07/2013 · 2. Fold each of the 6 pieces of paper in half, diagonally If the paper you are using does not make a perfect triangle, cut off the rectangular edge that sticks out and make it align perfectly. Snowflakes in winter are such a lovely window decor. Creating flat snowflakes is fun and gives a lot of variations. But why not trying a 3d snowflake? how to make korean rice paper Our finished snowflake decoration. Day 4 of our 12 Crafts of Christmas posts and this one is cooler than a polar bear’s toenails. This lovely 3D Snowflake looks pretty tricky to tackle but is actually really simple. The rumor here in Portland is that it may snow tomorrow. 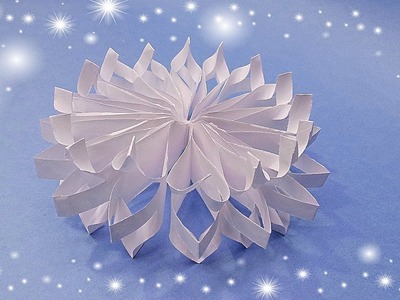 What a perfect time to post the tutorial for the 3-D paper snowflakes, right? If it does not snow outside, at least it will be inside. Most of us have made the pretty fold-and-cut snowflakes that look like patterned lace when unfolded, but this year we’ve decided to step things up with three dimensions of papercraft! Here is a great and simple craft project to make 3D Lacey Paper Snowflakes for Christmas decoration or room decor for cold season. I prefer to use fluffy white felt which is sturdy enough during curling. Snowflakes in winter are such a lovely window decor. Creating flat snowflakes is fun and gives a lot of variations. But why not trying a 3d snowflake?